"This is a big man thing, not a boy thing." - An indirect quote from Asafa Powell, apparently directed towards Yohan Blake after the 100m at the Jamaican World Champs trials where Asafa won. Blake's coach, Glen Mills, thinks that provided extra motivation for Blake ahead of WC's. Havent broke 16 mins in 5k whats the point? Can we identify the very first LetsRun thread? Brojos: Please take the picture of Makau with the beer down! Patrick Makau Says He's Satisfied With Breaking The WR If he also wins the World Marathon Majors title and the half a million dollars that goes along with it that “will just be a bonus”. 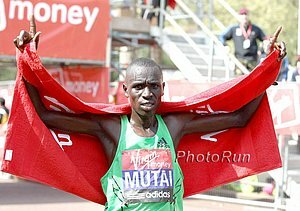 Right now he is in the lead, but Emmanuel Mutai is only 5pts back with still NY and Chicago to go. LRC: NCAA XC Polls Closing Soon: Get Your Votes In With the collegiate cross-country season about to have its first important meets of the year, it is time for 2011 LetsRun.com Poll #1. National and/or conference voting closes Wednesday. Paula Radcliffe To Have Ankle Surgery This Friday If Paula can get 100% healthy, Sunday's run in Berlin shows she can be a factor in London 2012. 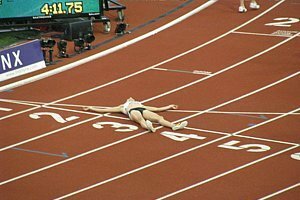 *British Media Falls In Love With "Starlet" Hannah England, Who Won Silver Some great photos of her on her victory lap. *Seb Coe Always Believed In Her As Well (But Few Others) It's a shame the British media doesn't realize how hard it is to win an NCAA title. NY Times: Decision On LeShawn Merritt's Olympic Eligibility Case To Be Made This Friday Whichever way this decision goes, it will have huge implications for past doping offenders everywhere. NCAA Vin Lananna Talks About Plans For Lukas V And The Rest Of The Oregon Stars He says Lukas really wants to race this weekend, but he's hesitant to have him open this early. Talks about the plan for Jordan Hasay and Matt Centrowitz for track season. The 100% focus will be on the Olympics so we're pretty sure that means no more doubles and triples at NCAA's for Hasay. Good Read A Brief Chat with Matt Centrowitz Sr. Matt Centrowitz Jr.'s dad is very honest in his evaluations of his son saying "He's 21, but he's younger than that between the ears." Article On Alan Bell, The Man Who DQ'd Usain Bolt In The 100m Final At Daegu He says it was easy as even Usain's mom called him a 'silly boy'. 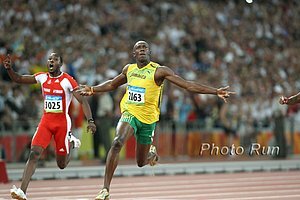 Bolt Says He Thinks False Start Rule Should Be Changed Bolt: "They really should go back to one false start and charge it to the field. It's easier. Somebody makes one mistake and everybody can relax." After Helping Kids At Track Clinic In LA, Bolt Talks Tyson Gay And Yohan Blake Bolt is in LA for some sponsor commitments (Puma and Hublot) and he took time to talk about how 2012 will be tough for Tyson Gay and things will not be different between himself and training partner Blake. Some pics on his twitter account. Tyson Gay Partners With EAS Sports 100% Certified Program Even though Gay's training partner Steve Mullings tested positive this year, Gay has always been active in the anti-doping community, volunteering for USADA's stringent testing program in 2008. Sony Releases Special Edition "Meb" Walkman We at letsrun are a little late on this news. 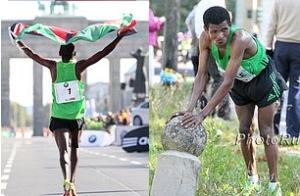 Another Stupid IAAF Pacing Rule: Pacer Who Broke 30km World Record In Berlin (Pacing Makau) Doesn't Get The Record Because He Didn't Finish The Marathon So the guy who ran 30km faster than anyone else in the world will not be the record holder. 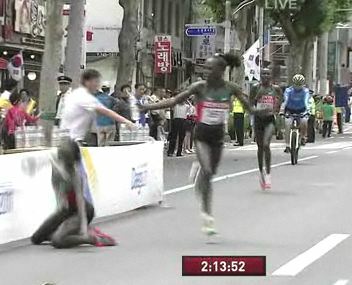 Lisbon: Despite Heat (78 F), Mary Keitany Breaks Her Course Record By Over A Minute In Lisbon, Desiree Davila Runs 1:11:27 Discuss Desi's run here. 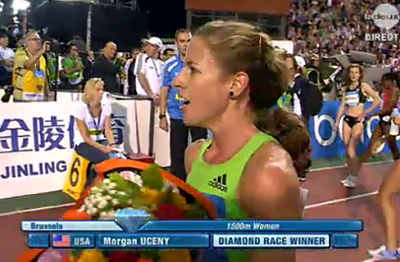 Brief Chat With Morgan Uceny "Sometimes when you see someone like (Maryam) Jamal, they're foreign, and have an aura of mystery, and you kind of put them on a pedestal at times - for no reason, because really, at the end of the day, we're all athletes and we're all training hard to be the best. Why shouldn't it be me and not her?" LRC: NCAA XC Poll: Get Your Votes In With the collegiate cross-country season about to have its first important meets of the year, it is time for 2011 LetsRun.com Poll #1. National and/or conference voting now open. Prefontaine Classic Ranked As #1 Meet In 2011 In Terms Of Overall Performances Pre was incredible this year but we'd love to have someone tell us why the track is so much faster than other tracks in the sprints. Email us. *Ciaran Ó Lionaird Talks About Move To Oregon To Be Coached By Alberto Salazar Apparently Salazar recruited him in between races in Daegu. *After His 2:10 Debut, UK's Scott Overall Thinks He Can Still Go Faster His US coach Robert Chapman says that bhe ran the 2nd half completely alone and could run maybe 2:08-09 with competition/pacers. Nick Symmonds Says He Still Hasn't Rewatched Daegu 800m Final, Says More And More Guys Want To Go Wire-To-Wire We never thought of front running as advantageous in the 800, but Symmonds points out more guys are doing it. Gags chewed him out after Daegu for getting passed on the final turn. *AP Article On Women's New Marathon Record Rule Mary Wittenberg says she thinks it's "probably a two-minute advantage" when the women run with the men. Both her and London director David Bedford think there should be two separate records, one with men, one without. *Canada Won't Follow IAAF Road Record Rule They say that national records run by women in mixed races will stand. 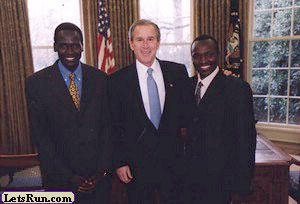 Please Say It's True: Geoffrey Mutai And/Or Mary Keitany Running ING NYC Marathon? That's what Renato Canova says about one or both of the top marathoners in 2011. Track Superfan Picks Apart Philip Hersh's Article On Yohan Blake Philip Hersh, one of the top Olympic writers in America, wrote an article asking the questioning whether Yohan Blake is doping. While we feel the question is a totally legit one to ask (and Blake does a have a drug positive that got him a 3-month ban), Hersh's main argument that Blake may be doping is the sudden improvement of Blake in the 200. 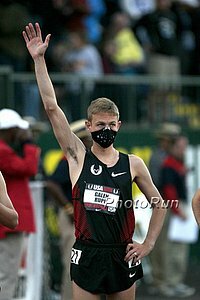 The Superfan takes a wider view and looks at Blake's improvement in the 100 and 200 combined and also heavily cites a LetsRun.com article critical of Hersh to question Hersh's intellectual honesty. We no longer question Hersh's intellectual honesty and generally are fans of his work, but think the Track Superfan's article is a good read. 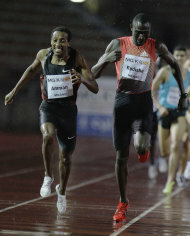 Toni Reavis Blogs About Lack Of Marquee Matchups In Sprints Toni makes comparisons between boxing and track and field. We've always thought that was a decent comparison but hope track and field does not go the way of boxing, where a few guys get rich, but the sport falls even farther off the national radar. Kenyan Benson Barus Wins Virginia Beach Half Marathon In 1:02:22, Ryan Hall 4th In 1:03:02 Hall said, "I think I could run a marathon at that pace but when I'd go to the front and try to go a faster it would feel very uncomfortable. That's a good sign actually."